Zion Market Research has published a new report titled “Injectable Drug Delivery Market by Type (Formulation and Devices), by Application (Autoimmune Diseases, Oncology Disorders, Hormonal Disorders, Orphan Diseases, and Others), and by End-User (Hospital, Home Care, Ambulatory Care, Physician Offices or Clinics, and Others): Global Industry Perspective, Comprehensive Analysis, and Forecast, 2018–2025”. 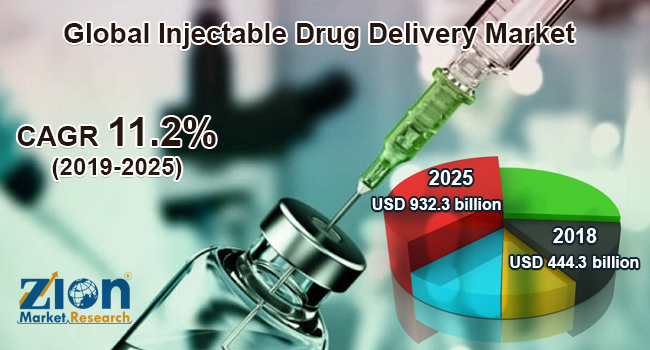 According to the report, the global injectable drug delivery market was USD 444.3 billion in 2018 and is expected to generate around USD 932.3 billion by 2025, at a CAGR of 11.2% between 2019 and 2025. The global injectable drug delivery market is anticipated to grow at a considerable rate over the forecast time period, owing to the growing prevalence of various chronic diseases, such as cancer, heart diseases, diabetes etc., and technological innovations related to advanced device development in injectable drug delivery systems According to the RAND Corporation, about 60% of Americans live with at least one chronic disease and about 42% are suffering from more than chronic disease. The various technological developments have resulted in the growth of innovative devices that are specially developed according to specific patient care category. Furthermore, the introduction of dual-injectable devices has further improved the method of injectable drug delivery. However, in the healthcare sector, the lack of awareness regarding contaminations and injuries caused by the use of needles in syringes might hinder the growth of the global injectable drug delivery market in the upcoming years. According to the WHO (World Health Organization), every year more than 2 million needlestick injuries are recorded globally. The continuous growth in the number of infections and injuries caused by needles in the past few years has led to patient hesitancy to use injections, which might also obstruct the growth of the injectable drug delivery market globally over the estimated timeframe. Nevertheless, the increasing demand for generic injectable and biosimilar is anticipated to generate new growth opportunities in the future for the injectable drug delivery market. The global injectable drug delivery market is fragmented into type, application, and end-user. By type, the global injectable drugs market includes formulation and devices. The formulation segment is sub-segmented into conventional drug delivery (suspensions, solutions, lyophilized formulations, and emulsions), novel drug delivery (long-acting injection formulation, colloidal dispersions, and microparticles), and others. The devices segment includes conventional injection devices and self-injection devices. The self-injection devices segment is further classified into needle-free injectors (NFI), pen injectors, wearable injectors, auto-injectors, and others. The conventional injection devices are segmented into prefilled syringes, fillable syringes, and others. In terms of market share, the formulation segment held the largest share in the global injectable drug delivery market in 2018, owing to its high efficiency and minimal size. By application, the global injectable drug delivery market is segmented into autoimmune diseases, oncology disorders, hormonal disorders, orphan diseases, and others. Hormone disorders held the largest share of the global injectable drug delivery market in 2018, due to the growing prevalence of hormonal disorders, such as diabetes. By end-user, the global market includes home care, hospital, ambulatory care, physician offices or clinics, and others. The home care segment held the largest share of this market, due to the high use of self-injectable pens and other devices at home majorly by diabetic patients. By geography, the global injectable drug delivery market includes Latin America, North America, Asia Pacific, Europe, and the Middle East and Africa. North America held the largest share of the global market in 2017 and is anticipated to remain dominant over the forecast time period as well. In terms of growth rate, the Asia Pacific region is expected to register the highest CAGR over the estimated time period. India and China held the largest shares of the Asia Pacific injectable drug delivery market in 2018. Some key players of the global injectable drug delivery market are Baxter International, Nova Nordisk A/S, Becton Dickinson, Sanofi, Pfizer, InjexPharma GmbH, Terumo Corporation, Unilife Corporation, Gerresheimer AG, Vetter Pharma-Fertigung GmbH & Co. KG., Schott AG, and Eli Lily & Company.